Juventus keeper Gianluigi Buffon is a rare commodity. The Italian born sensation is one of the few elite keepers in the world. 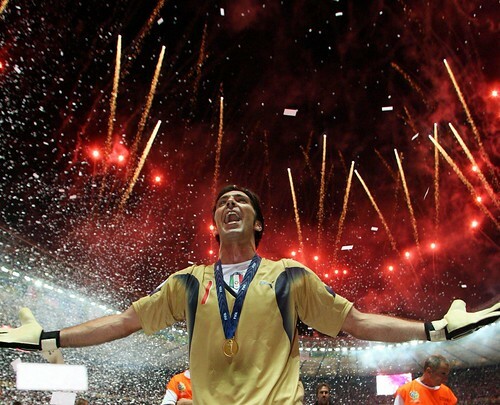 Buffon joins the ranks of only two other men in the world: Iker Casillas of Real Madrid and Julio Cesar of Inter Milan. And when you are one of the best in the world that means that you are wanted by several different clubs. And considering Juventus’ terrible form last season many critics claimed that the former World Cup champ was headed to England and the EPL this season. But Buffon will remain with his Juventus side and this year the former powerhouse club aims to secure a top four berth once again. And Buffon recently admitted why he didn’t have much interest in leaving his Serie A side for Manchester City. Apparently the keeper believes that the loose spending Blues haven’t fixed their defensive half of the pitch. I knew of Manchester City’s interest in me a couple of years ago and, while I was never close to signing, I can now see that I made the right decision. They have signed some great players but I get the feeling they are signing great players for the sake of signing them. Carlos Tevez, David Silva, Yaya Toure and a few others would make it into any squad in the world. But they don’t have one defender that would even get near the Juventus, Real Madrid, Barcelona or Manchester United team. Interesting statement considering Juventus was one of the most disappointing defenses last season in Serie A, but apparently Buffon believes in the players the squad currently have and even compares their back line to the best ones in the world. Great teams are always built from the back and I am really surprised they are not trying to do that, considering their coach is an Italian. Whenever I have been successful for either club or country it’s because I have had great defenders in front of me, players like Alessandro Nesta and Fabio Cannavaro. Without defenders of that quality I would not have won what I have won. If they don’t sign at least two world-class defenders before the transfer window shuts, I am not sure they will even make a top four finish, let alone win the Premier League. I wonder if Manchester City is writing this down. Either way it appears that Buffon is happy with his Juventus club for the time being. But you never know. Things could change fast if the defense has another frustrating season.